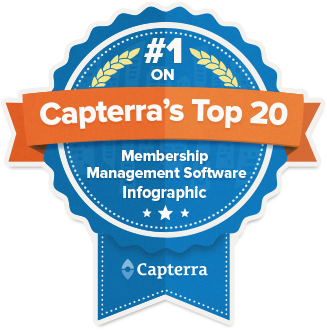 Wild Apricot is proud to receive the coveted #1 spot in Capterra’s Top 20 Membership Management Software Infographic for the second year in a row. 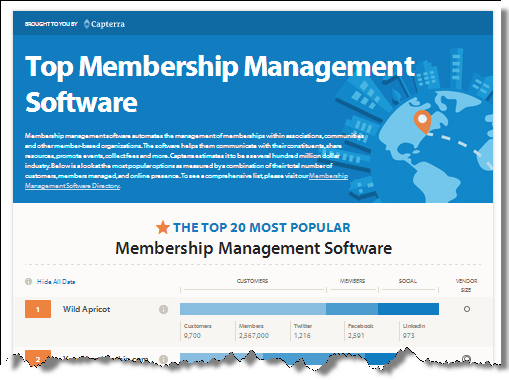 Capterra (a business software directory) conducted research to find out which membership management software options are the most popular, and published them in a new infographic: The Top 20 Most Popular Membership Management Software Solutions. It is interesting to note that even though Wild Apricot was among the smallest software companies, we had the largest customer base among the Top 20. Of course since our mission is to provide solutions designed for small membership organizations, we ranked lower than the larger companies in terms of total number of members. If you’d like more details on the data Capterra used to come up with the popularity index for the Membership Management software solutions featured in the top 20, you can check out their blog post here. We’re proud that we can once again display the badge of honor for being #1 in Capterra’s Top 20 list. But we’re also really pleased with the dozens of reviews our membership management software has received on the Capterra directory. Congratulations! I'm shopping around for a new platform so it is nice to read this posting.